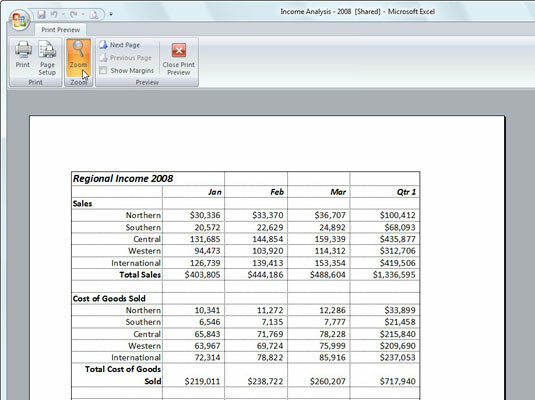 Save wasted paper and your sanity by using the Print Preview feature in Excel 2007 before you print any worksheet, section of worksheet, or entire workbook. You can use Print Preview to see exactly how the worksheet data will be paged when printed and to make last-minute changes to the page settings before sending the report to the printer. 1Click the Office Button and then point to the arrow beside the Print option. The Print options appear in the right pane of the Office button menu. 2Click the Print Preview command. 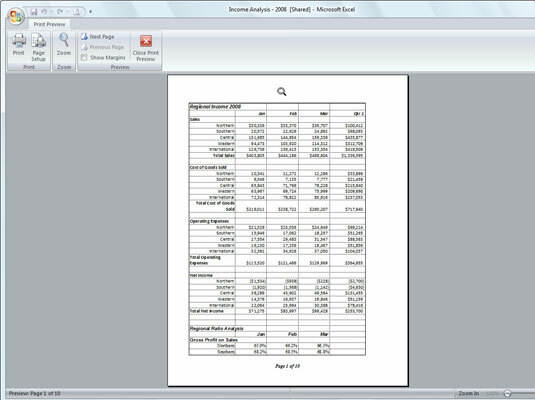 Excel displays the first page of the report with its own Print Preview contextual tab. Notice that you can barely read its contents. When positioned over the worksheet, the mouse pointer becomes a magnifying glass. 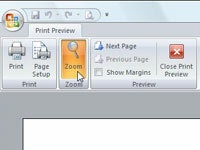 3Click the Zoom button on the Print Preview tab (or click the previewed page with the magnifying glass pointer). The previewed worksheet displays at 100% zoom so you can see the details. After you enlarge a page to actual size, you can use the scroll bars or the arrow keys to bring new parts of the page into view in the Print Preview window. 4To return to the full-page view, click the mouse pointer on the page or click the Zoom command button on the Print Preview tab. 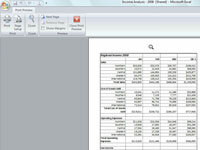 Excel indicates the number of pages in a report on the Status bar of the Print Preview window. If your report has more than one page, view pages that follow by clicking the Next Page button in the Preview group of the Print Preview tab. To review a page you’ve already seen, click the Previous Page button. 5Click the Close Print Preview button to return to the previous view. You can also choose to modify the page setup or print directly from the Print Preview tab by using the buttons in the Print group.